When producing Steroids you must work with a proven recipe; by doing this you save yourself the time and hassle associated with the trial and error methods. Our Steroid Calculators allow you to take the ratios of Benzyl Alcohol and Benzly Benzoate and rescale a recipe to make any volume of finished product that you require. This recipe produces 100ml of Trenbolone Acetate @ 100mg/ml. What if you had only 13g Trenbolone Acetate left? Or 27g? This is where the Steroid Calculator becomes useful. The dosage was selected at 100mg/ml as per the recipe. Powder weight always remains the same. BA Concentration increase from 0.18 to 0.2 (18% -> 20%) as per recipe. BB Concentration remains the same as per recipe (2%). The amount of oil was increase until the Powder value read 13g. Oral Steroids are manufactured in an extremely simple manner. First the dosing per pill/capsule is established (50mg/100mg etc), then this dose is mixed with a filler substance to bulk up the mixture for pressing to be inserted in the capsule. The type of filler that is used must be something inane, that will not react with the compound in any way and must also be safe for human consumption. When purchasing oral steroids from QualityRaws you receive the compound in its raw and pure form. The active dose of some of these compounds may be as low as 12.5mg, which is simply impossible to accurately measure even with the most sensitive digital scales. What one must do is use a filler to mix with the compound and create a 'Dosing Mixture'. This mixture allows for easy measurement of dosage and creating this mixture could not be anymore straight forward - with the use of our unique Oral steroid Calculator. For the filler we have chosen to use Icing Sugar, it is important to choose a powder that is as fine as the compound you are using. Experience has shown that Icing Sugar is ideal for any oral Dosing Mixture. The 'Dosing Mixture Weight (DMW)' is the weight of the mixture you intend to weight out to give the active dose of the compound you are taking. For example, you plan on taking 50mg of Dianabol everyday, you intend to take 1g of Dosing mixture to get the 50mg of Dianabol. That 1g is the 'Dosing Mixture Weight (DMW)'. 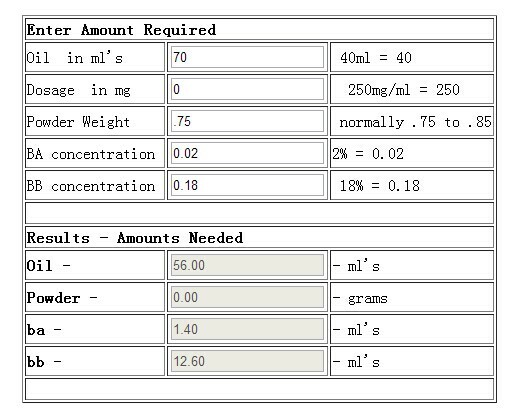 The Active Dose per DMW in the example above would be 50mg. It is the dose you intend to be taking of which ever compound. You have purchased 5g of Exemestane. You want to take 12.5mg twice a day. Simple convert all the above into milligrams(1000mg = 1 gram) and input into the Oral steroid Calculator and it will work out how much Icing Sugar to add to your compound. Simply mix the two together and you are finished. We would advise you to store your Dosing mixture in a suitable air tight container in a cool environment away from moisture. All of the above information is providing in agreement with our Terms and Conditions. To purchase the Oral and Injectable Steroid powders please click here.